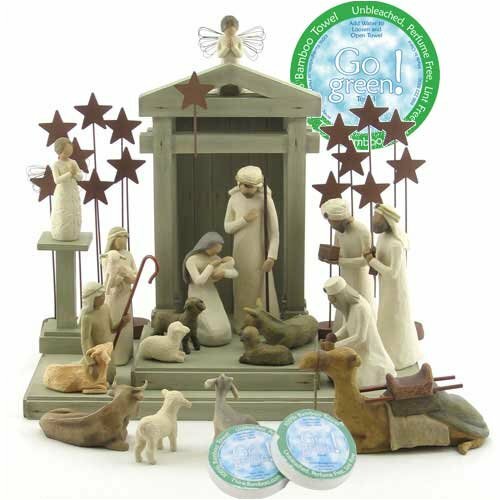 Included are the following items: 26106 Creche, 26005 Nativity, 26105 Shepherd and Stable Animals, 26027 Three Wisemen, (2) 26007 Metal Star Backdrop, 26012 Angel of Prayer, 26107 Angel Stand, 26170 Angel A Tree, 26180 Ox and Goat, 3 Go Green! Compressed Rayon from Bamboo Towels . Willow Tree is an intimate, personal line of angels, figurines, ornaments and keepsake boxes representing qualities and sentiments that make us feel close to others, heal wounds, or treasure relationships to living things. The name Willow Tree symbolizes that which is gestural, beckoning and romantic. The figures are columnar in design, like a tree, and often carry flora or fauna symbolic of human virtues or qualities. The angels are rendered so as to reveal their expressions through body gestures only a tilt of the head, placement of the hands, a turn of the body. The absence of facial features contributes to the quiet and modest design. Emotions and feelings are left to the viewer to discern, which makes them very personal and powerful. Susan Lordi's inspiration comes from a love of family, closeness to friends, and an appreciation of nature. Her art is intimate and personal, reflecting that which helps us treasure our relationship to people and the world around us. Included are the following items: 26106 Creche, 26005 Nativity, 26105 Shepherd and Stable Animals, 26027 Three Wisemen, (2) 26007 Metal Star Backdrop, 26012 Angel of Prayer, 26107 Angel Stand, 26170 Angel A Tree, 26180 Ox and Goat, 3 Go Green! Compressed Rayon from Bamboo Towels . 3 Go Green! Compressed Rayon from Bamboo Towels are 100% Eco-friendly bamboo derived fiber measuring a handy 14" X 18" compressed down to the size of an Oreo cookie. Towels not shown to scale.